A series of bronze flagons for pouring mead, wine or beer enables us to trace the development of La Tène style both in vessel shape and in decoration. The shape is usually attributed to the influence of Etruscan trefoil Schnabelkannen, several of which have in fact been found in Celtic tombs (see example from Vix). 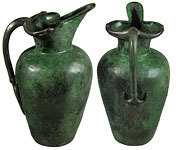 An early Celtic example, the flagon from Kleinaspergle, demonstrates that the proportions of the local vessels are entirely different from those of their "prototypes." At the same time, the ornament patterns are composed in a distinctively local style as well. The ribbed flagons from the Dürrnberg and the Glauberg are startlingly similar, although they were found many days' journeys apart, suggesting long-distance movement of goods and/or craftspeople. An imported Etruscan flagon (in Besançon) was covered with elaborate La Tène incised patterns that blithely disregard the style of the flagon's own handle attachment, an example of the "Celtization" of Mediterranean imports. Similarly incised are the bodies of the distinctive Röhrenkannen from Reinheim and Waldalgesheim -- vessels of distinctly un-classical shape covered with exuberantly Celtic designs. In the light of Jacobsthal's comment on Celtic women and drink (1934, 19), it is interesting to note that none of these few example was found in a demonstrably male burial, and several are from unambiguously female contexts.